Hi guys, we know very well about the MS Excel. MS Excel is an application software which is widely used in different locations. MS Excel is an electronic spreadsheet software which is used for data analysis, modeling, representation data inform of chart, solve complex calculations using functions and many more. Today we have to discuss about an important utility of MS Excel is Fill Handle. With the help of Fill handle you can easily copy or generate the series. Lot of person’s are doing day to day job on the Microsoft Excel. If you want to generate or copy series using the fill handle facility in Microsoft excel any worksheet & If you are an experienced holder then you can easily work on any worksheet in excel, but if you are novice user then you feel trouble during working on any worksheet in excel. So, in this article I try to show you who you could easily use fill handle facility with its different options in excel to copy or generate series. Microsoft excel provide a wide variety of fill handle options from which you can easily copy or generate series and this can be done either using from fill option which is given in “Editing” group of “Home” standard tabs in Microsoft Excel application window. Have a look brief description of these option. If you want to increase cell values 2 points which is starting from 100 up to 120 then you have to select this option in series box of fill option. Step 1: Type the value 100 in cell A1 and select the range A1:A11. Step 2: Click Home standard tab-> Click Fill option in “Editing” group -> Select “Series…” option -> Click on the “Liner” option and type 2 in step value to increment value and 120 to define finishing point in the stop value in the Series dialog box then click OK button. MS Excel generate the series 100, 102, 104, 106,………..120. This option is used to generate the series by increasing geometrically multiplying by given number or value. Step 1: Type the value 2 in cell A1 and select the range A1:A6. Step 2: Click Home standard tab-> Click Fill option in “Editing” group -> Select “Series…” option -> Click on the “Growth” option and type 2 in step value to increment value and 100 to define finishing point in the stop value in the Series dialog box then click OK button. MS Excel generate the series 2, 4, 8, 16,………..64. This option is used to generate the series by increasing date in any required date unit like Day, Weekday, Month or Year as per your requirement. Step 1: Type the value “9/1/2014 in cell A1 and select the range A1:A6. Step 2: Click Home standard tab-> Click Fill option in “Editing” group -> Select “Series…” option -> Click on the “Date” option -> Select “Day” option in Date Unit in the Series dialog box then click OK button. MS Excel generate the series 9/1/2014, 9/2/2014,……….,9/6/2014. You can also use this option to quickly generate the series by increasing date in any required date unit like Day, Weekday, Month or Year as per your requirement. Step 1: Type the value “9/1/2014” in cell A1 and select the range A1:A6. Step 2: Click Home standard tab-> Click Fill option in “Editing” group -> Select “Series…” option -> Click on the “Trend” option -> Select “Liner” option in Type and select “Day” option in Date unit in the Series dialog box then click OK button. MS Excel generate the series 9/1/2014, 9/2/2014,……….,9/6/2014. You can use this option to quickly generate the series by increasing the one point in the given value as per your requirement. Step 1: Type the value 1 in cell A1 and select the range A1:A6. Step 2: Click Home standard tab-> Click Fill option in “Editing” group -> Select “Series…” option -> Click on the “Auto Fill” option -> in the Series dialog box then click OK button. MS Excel generate the series 1,2,……….6. I hope you like this post. 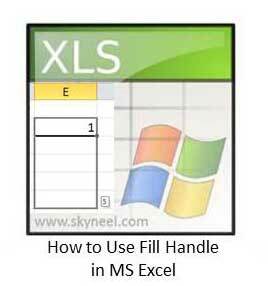 After reading this article you will be able to use Fill Handle in MS Excel. With the help of Fill handle you can create or generate series as per your need. Kindly share your knowledge with your friends, colleague, family, staff members and others. Give your important suggestions in the comment box. Thanks to all.